On my Twitter page today I’m recapping in 140 characters or fewer some of the amusing and other gifts for readers that I’ve mentioned on One-Minute Book Reviews and that you can still find, such as the Shakespeare’s Insults Magnets and the Jane Austen Action Figure. You don’t need to have your own Twitter account to see these. Just click on “my Twitter page” in the first sentence of this paragraph. The Awesome Kid Coupon Book: 52 Ways to Say You’re Special and You’re Loved!’ Hallmark Gift Books, unpaged, $5.95, paperback. O come all ye slackers who have fallen behind in your shopping for a child! Why not wrap up coupons good for the kinds of gifts described in this book — a waiver of a chore, a one-hour bedtime or curfew extension, or the right to “play the music you want for as loud as you want for one hour”? The Awesome Kid Coupon Book has firm roots in a core principle of child psychology: Kids want to get out of doing some things as much as they want to have permission to do others. So this book has a coupon that lets a child to skip the vegetables at one meal as well one that confers control of the TV remote for an evening. Worst line: “BE A WINNER — Present this coupon and three scratch-off lottery tickets will be purchased for you. If you win, the money’s all yours!” This coupon seems to encourage adults to skirt the legal ages for buying lottery tickets (18 years old in most states, 21 in a few) by buying them for children. Would Hallmark have said, “Present this coupon and three six-packs will be purchased for you”? 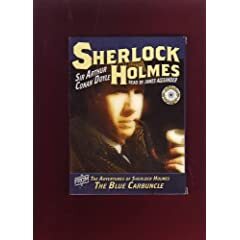 Warning: I found this book at a large CVS in September 2008 but haven’t been able to find it anywhere, including on the Web, since then. This is unusual: Books rarely go out of print so fast, and this one may have been recalled because of the lottery issue I mentioned above. I decided to post this review, anyway, because a) you might have better luck than I did at finding the book and b) some of its ideas may provide inspiration for homemade coupons. Nobody does board books better than Helen Oxenbury, who has twice won the Kate Greenaway Medal, Britain’s equivalent of the Caldecott. Oxenbury’s great gift is her ability to create faces that are simple yet expressive and never dull or cloying, which is just what young children need. You see her skill clearly in her engaging series of board books about babies at play, which includes Clap Hands, All Fall Down, Say Goodnight and Tickle, Tickle. (Simon & Schuster, about $6.99 each) www.simonsayskids.com. Any infant or toddler would be lucky to have one of these as a first book. Children’s poet Jack Prelutsky pays homage to Lewis Carroll’s “The Crocodile” in Behold the Bold Umbrellaphant: And Other Poems (HarperCollins/Greenwillow, 32 pp., $16.99, 3 and up) www.jackprelutsky.com, a collection of brief rhyming poems about imaginary animals. But this picture book stands on its own with amusing poems about fanciful creatures such as an “umbrellaphant” (an elephant with an umbrella for a trunk) and sparkling illustrations by Carin Berger. 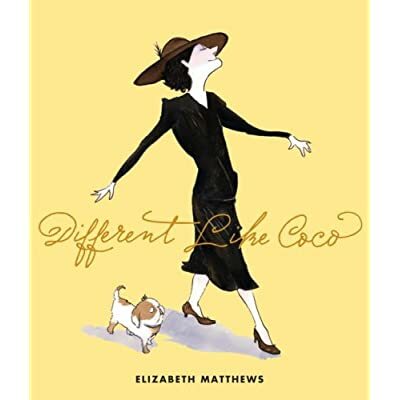 Elizabeth Matthews makes a stylish debut in Different Like Coco (Candlewick, 40 pp., $16.99, ages 6–8) www.candlewick.com, a witty and spirited picture-book biography of Coco Chanel. Matthews focuses on the early years of the designer who learned to sew at a convent school, then revolutionized 20th century fashion with clothes that reflected and fostered the emancipation of women. The result makes clear that Chanel owed her success not just to hard work but to boldness and staying true to herself and her artistic vision. 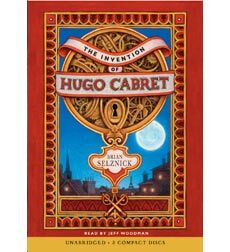 Brian Selznick has had one of the year’s biggest hits for tweens of both sexes in The Invention of Hugo Cabret: A Novel in Words and Pictures (Scholastic, 533 pp., $22.99) www.scholastic.com, a cross between a picture book and a chapter book. Selznick’s novel involves a 12-year-old orphan and thief who lives in a Paris train station and, in the days of silent movies, tries to complete work on a mechanical man started by his father. The beautiful packaging of this book helps to offset the so-so writing and unresolved moral issues it raises (including that Hugo rationalizes his thievery and mostly gets away with it) www.theinventionofhugocabret.com. Three-time Caldecott Medal winner David Wiesner says in The Art of Reading (Dutton, $19.99) that as teenager he was captivated by Arthur C. Clarke’s 2001: A Space Odyssey (Roc, $7.99, paperback) us.penguingroup.com. And that modern classic might still delight a teenager who likes science fiction (with or without a companion gift of the Stanley Kubrick’s great movie version). Or consider Mindy Schneider’s Not a Happy Camper (Grove, $24) www.not-a-happy-camper.com, an adult book being cross-marketed to teens. Schneider remembers her eight weeks at an off-the-wall kosher summer camp at the age of 13 in this light and lively memoir. (Sample experience: A bunkhouse burned down when a group of boys put candles under their beds to see if they could warm them up by nightfall.) This book is about wanting to fit in and never quite achieving it — in others, about the essence of being a teenager. Finally, a book for the college-bound, especially for the sort of high school student who might like to join a sorority or other all-female group: Marjorie Hart’s charming Summer at Tiffany (Morrow, $14.94) www.harpercollins.com, a book for adults that many teenagers might also enjoy. In this warm and upbeat memoir, Hart looks back on the summer of 1945, when she and a sorority sister at the University of Iowa became the first female pages at Tiffany’s, the Fifth Avenue jewelry store. They arrived just in time to watch the city erupt with joy when the Japanese surrender ended World War II and to have a much larger experience than they had expected. Hart’s account of all of it has none of the cynicism that infects so many books for teenagers, and that’s partly what makes it so refreshing. Reviews of books for children or teenagers appear every Saturday on One-Minute Book Reviews. 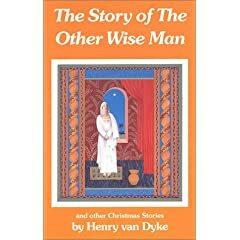 You can read others by clicking on the “Children’s Books” and “Young Adult” categories under the “Top Posts” list at right. 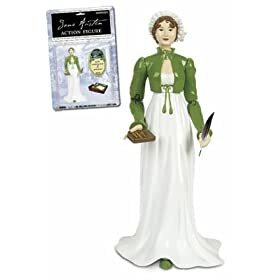 Jane Austen Action Figure I couldn’t find a reliable site that stocks the Jane Austen bobblehead dolls that librarians and others have seen. But the Library of Congress shop www.loc.gov/shop/ sells this plastic Jane Austen Action Figure (which comes with a quill pen and writing desk) for $8.50. Austen can’t do battle against Emily Dickinson and the Knights of the Nineteenth Century only because the Belle of Amherst doesn’t have her own action figure (though there’s a plush toy you can find on the Web if you’re determined). Be sure to read all the reader reviews on Amazon www.amazon.com, which also has the doll shown here, if this one tempts you. 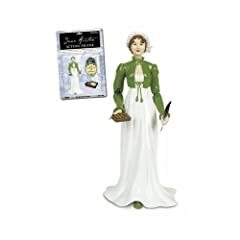 One critic faults the Jane Austen Action Figure for flimsy construction, including an insecure base and an arm that breaks off easily. Well, what did you expect? Austen died at the age of 41, and this one may have a correspondingly short life span. Librarian Tattoos In January a Los Angeles librarian won the Newbery Award for a young-adult novel that has the word “scrotum” on the first page. Now the city has given us another pacesetter in a product described as wash-off “librarian tattoos.” “Librarian stereotypes are as old and outdated as microfiche,” says the online catalog for the Library Store at Los Angeles Public Library says. “Nowadays you’re just as likely to see your local librarian driving a Harley as a Honda Accord.” That must explain why the library is selling a 3-1/2″ x 4-1/2″ hardcover book of nontoxic wash-off tattoos for $8, several of which you can see at right. “Put one in a prominent place to prove once and for all that ‘smart’ and ‘cool’ are not mutually exclusive!” the library says in its catalog www.lfla.org/cgi-bin/store/. Shakespeare’s Insults Magnet Set Are you the kind of person who loves to insult friends with barbs like “thou smell of mountain goat”? Or possibly you “bolting-hutch of beastliness”? If so, these multicolored magnets are for you. A set of 33 insults costs $15.95 at Shakespeare’s Den www.shakespearesden.com, a literary gift site that has items related — and I use the term loosely — to many authors. Among them: George Orwell magnetic finger puppets that you can put on your refrigerator or use for purposes such as — well, let’s stop here. My favorite Christmas decorations include these sterling silver Cat in the Hat and Peter Rabbit ornaments. Each is part of a series with scenes or characters from books by Dr. Seuss or Beatrix Potter (also available as charms and, in some cases, brooches). I first saw the Peter Rabbit ornaments in the gift shop at Hilltop, Potter’s home in the English Lake District, part of the Britain’s National Trust. In the U.S., you can order them for about $45 each from the venerable Hand & Hammer Silversmiths www.handandhammer.com, which also has the Seuss ornaments. This venerable Virginia company has made presentation silver for every president since John F.Kennedy, who received copies of Paul Revere’s lanterns for the Oval Office. I’ve ordered from its vast selection of sterling silver ornaments without problems. If you’re interested in a Seuss ornament, you might also try Seussland www.seussland.com, which has a good selection. The ornaments shown are “The Cat in the Hat,” left, and “Mrs.Rabbit and Her children,” right, both from the Hand & Hammer Silversmiths online catalog. … The 10 best books of 2007, hand-picked by Jan Harayda, editor-in-chief of One-Minute Book Reviews. This list will include fiction, nonfiction and poetry and books from small presses and soul-destroying multinational conglomerates. The One-Minute Book Reviews list of the 10 Best Books of 2007 will be posted by 8 a.m. Eastern Time. The funny gifts will be posted by 5 p.m. Eastern Time. Force majeure clause: It’s snowing here, and a nor’easter is on the way. Know someone who defines the necessities of life as “food, clothing, shelter and books”? Here’s a possible gift: a small pillow that shows a comment Thomas Jefferson made to his friend John Adams in 1815: “I cannot live without books.” (A few books stand to the right of the legend.) The pillow is a 12” x 14” cotton-and-polyester blend that sells for $34 the Library of Congress Shop www.loc.gov/shop/. I can’t link directly to the picture in its online catalog, but you can find it by clicking on the “Home Accessories” page or searching for “pillow” on the site. The catalog says the pillow is navy blue, though it looks burgundy, and usually ships in 3–4 business days. The shop also sells mugs, T-shirts and tote bags with the quote. The Library of Congress has more than 3,000 books from the collection of the third president.